They have gone from strength to strength since becoming parents. 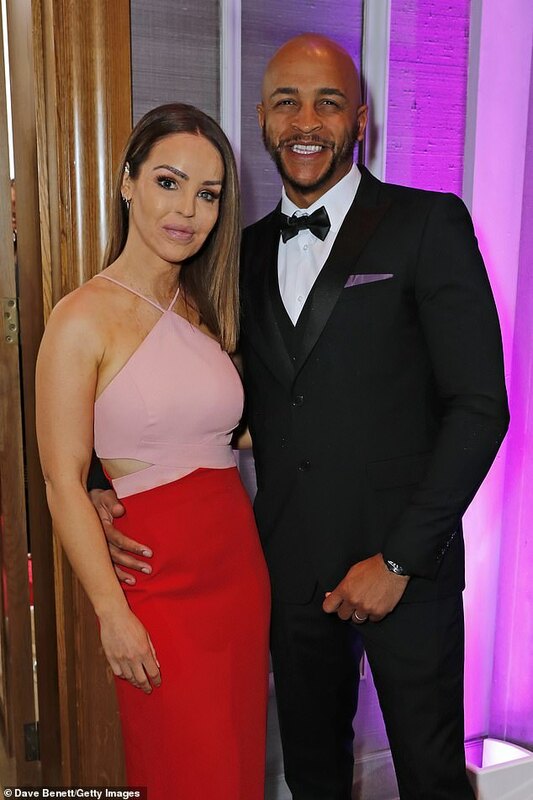 And Katie Piper joined her husband Richard Sutton for a rare night out at the Football for Peace initiative dinner by Global Gift Foundation at Corinthia London on Monday. The Strictly Come Dancing hopeful, 35, looked demure in a colour block dress as she cosied up to her dashing love inside the plush venue. Tasteful midriff cut-outs teased a glimpse of the model’s taunt stomach when she worked the floor at the star-studded dinner. A cheeky split at the back of the dress offered a sneak peek at Katy’s lithe legs as she twirled around in her sky-high red heels. The mother-of-two added a pop of pink lipstick to complement the pastel bodice of her dress which contrasted with the striking scarlet skirt. They enjoyed a rare night off their parenting duties to throw their support behind the glittering charity ball attended by the likes of Jess Wright and Kimberley Garner. After walking the red carpet, the stars headed inside for cocktails and a plush dinner. This was followed with performances from Jack Pack and Richard Jones as well as a live auction. Eva Longoria is the acting ambassador of the Global Gift Foundation; a charity that works to raise funds for foundations, charities and organisations that share its vision and aims. Recently, Katie revealed she had to have stitches at hospital after ‘smashing her arm down on a glass’ during a very ‘dramatic’ Mother’s Day. During Loose Women, the mother-of-two admitted she has become ‘clumsy’ as a result of being blind in one eye after she suffered at the hands of an ex-boyfriend and an accomplice in 2008. She told panellist Andrea McLean: ‘It was the minor injury unit so it wasn’t a big thing. ‘And I was talking with my hands which my mum always tell me is a bad habit, I was really animated and I smashed my arm down on a glass but unfortunately it went quite deep so I had to have stitches. Katie also revealed that she was six weeks post burns surgery at the time. She had been excited to get back to her every day routine with husband Richard and their two children, daughters Belle, five, and Penelope, 16 months.